This Bruegel Institute publication is very interesting. 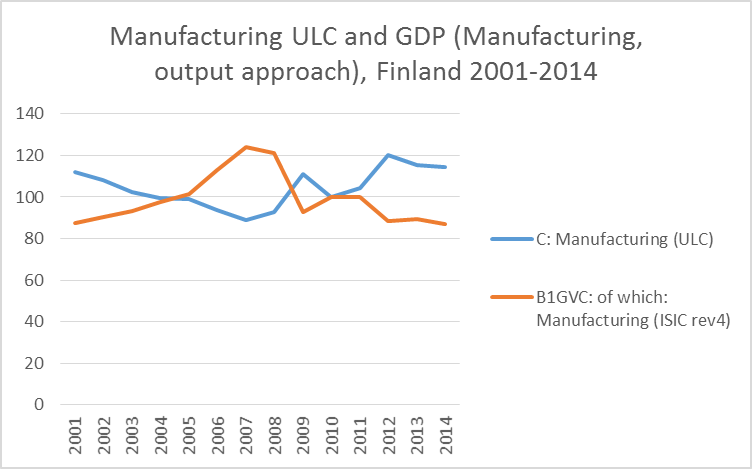 I still have to read most of it but since the value-added in manufacturing is much higher than in services (in general), it seems quite a good idea to work hard on the ‘environment’ in which firms can prosper. And no, this does not mean rock-bottom tax rates. The publication is apparently a reaction to this Communication piece from the European Commission (COM(2012) 582 final). It is likely most relevant for labour unions too. http://www.businessinsider.com/german-flash-pmi-2013-4 Flash PMI for Germany. The effects were bound to show up at some point, given Germany’s export-led growth model and the destruction of European export markets through austerity. My chain-link here would be Spain/Italy-France-Germany as the path of contagion. Victims are thus very much The Netherlands, Eastern Europe ( Germany’s “workplaces”) and eventually Finland.